I am particularly proud of this newest edition that will offer all competitors, runners and adventurers easier accessibility to our event. Our team has placed significant effort in continuing to maintain the highest of standards for which we are known, since its inception. The Traversée du lac Saint-Jean on bicycle, is a unique challenge as experienced nowhere else in the world. I invite you all to come out in numbers and experience with us this frozen adventure. Swimmers have crossed Lac-Saint Jean each year since 1955. This event is unique for those who wish to cross…. on bicycle…. and to embrace a frozen Québécois winter on a 32 kilometer linear course of ice and snow. In 2018, 100 runners and 300 adventurers from the four corners of the planet, are expected to take their places at the starting line in Roberval, racing until their arrival at the finish line in Péribonka, hopeful of fulfilling this unique frozen adventure. A CHALLENGE LIKE NO OTHER! We welcome you all. The Traversée du lac Saint-Jean won the Canadian Tourism Grand Prix awards in the adventure and outdoor tourism category. This great distinction confirms that the efforts made to promote our event and the region internationally have borne fruit. Michel de Champlain President of the Veloroute des Bleuets was present in Ottawa to attend this prestigious evening. "I want to share this honor with the organizing committee, the partners, but especially with all the volunteers who allow nearly 300 cyclists to experience this magnificent challenge of crossing Lake Saint-Jean." 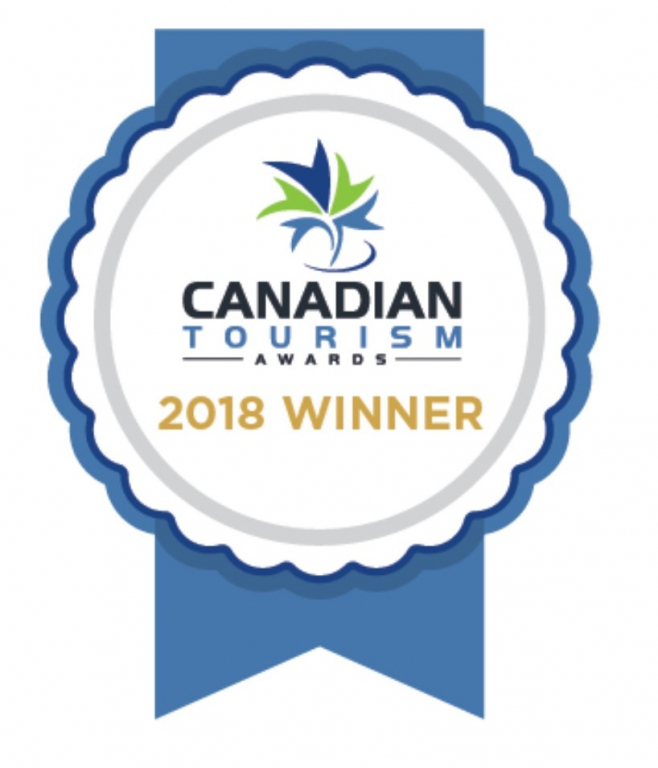 We are confident that this award will shine throughout the winter tourism industry.